‘I’m really pleased that so many people enjoyed the Brighton scene so much. I’ve just begun a tentative survey of the Brighton book trade and would very much like to hear from anyone with any pictures or stories.’ This comment was posted here at My Brighton and Hove over two years ago. 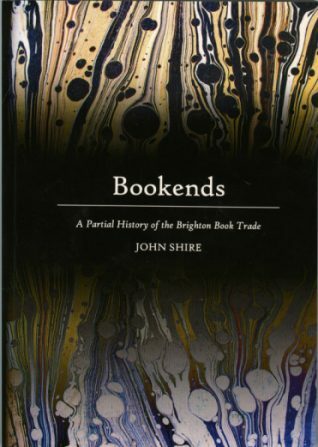 As you will see, John Shire’s ‘tentative survey’ was like Topsy and grew, and his new book ‘Bookends: A Partial History of the Brighton Book Trade’ is the result. In his introduction, the author tells us that his book is about ‘one small city, its bookshops and their inhabitants’ and it does indeed provide an interesting narrative of the development of Brighton book shops from the 18th century to the present day. But more than that, it also allows a fascinating insight into the lives of the owners of these shops, as they sometimes struggled to stay in business. The book is divided into sections which either deal with various aspects of the book trade, particular events, or individuals in its Brighton history. I read with particular interest, the section entitled ‘The Filth’. It contains a very clear account of the events surrounding the case of Bill Butler’s Unicorn Book Shop in Gloucester Road, and the ensuing obscenity trial in 1968. I have to admit that I did not expect to enjoy ‘Bookends’, as I have no knowledge of, or particular interest in, its subject. But I was very pleasantly surprised. Having started reading it for the purposes of this review, I am continuing with it just for pleasure. It is meticulously researched and written with an elegant and accessible style. Available at: Colin Page, Duke Street; Sandpiper Books, Kensington Gardens; City Books, Western Road and The Smallest Book Shop in Brighton, downstairs at Fanny’s Cafe, Islingwood Road. Why is “South Lanes” used to refer to the Old Town? I would guess it was furthest south of all the Laines, and the Old Town sat right on the coast. You can’t get much further south than that! People have ‘invented’ the name South Laines because they think (wrongly) that Laine with an ‘i’ is an old-fashioned spelling of the word Lane, meaning a little alley or street. It isn’t. The two words aren’t connected in any way. Laine with an ‘i’ meant a large field. In the 18th century Brighton was divided into five large fields or laines: West Laine, East Laine, North Laine, Little Laine and Hilly Laine. Only the name North Laine survives today (more accurately was revived when the area became a Conservation Area). So it is quite incorrect to refer to South Laines. Old Town is the correct name. When I realised that Visit Brighton itself was promulgating the myth and re-writing the Old Town out of existence, I reached for my pen and the error was rectified within 24 hrs. It originally stated: Once the heart of the old fishing town of Brighthelmstone, Brighton South Lanes’ historic quarter is…http://www.visitbrighton.com/site/maps-guides-and-interactive/brightons-villages/the-lanes. Back to the point of this thread though, the last decent Occult bookshop (13 St James St) closed down recently. It moved two doors to 11 St James St for a few weeks and then closed down. Over the years so many secondhand bookshops have disappeared, but discovering today the closure of Duke Street’s Colin Page has been a real shock ; it’s left me with a sense of sadness not experienced since the loss of the great Holleyman & Treacher. Sincere thanks for thirty-odd years of quality and memorable service, the last of its kind in Brighton.